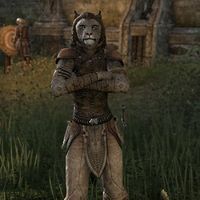 Anala is a Khajiit sailor and a member of Captain Erronfaire's crew. She has not reported for duty and the captain wishes for you to find her. Erronfaire needs you back at the docks. Now. If you talk to her afterwards, Anala will tell you, "A Maormer infestation of Auridon could be very, very bad. Anala hates to think of how bad this could be." Meeting her after the quest, she'll say, "Word of Degail and the Maormer reached Anala's ears. This one is glad you found her, but sad the rumors to prove true." This page was last modified on 7 April 2019, at 04:12.